But what does Ford's secret message mean? On March 14, 2019 at 8:02 PM, Ford tweeted out an image of the Mustang logo in an electric blue color with the caption "Hold your horses." 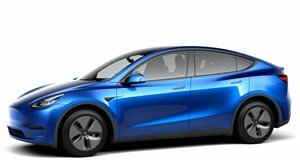 We've seen the Mustang logo shown in this color before during a Ford commercial talking about the future of electrification. The timing of this tweet was no coincidence as . Ford was clearly trying to steal some of the attention away from Tesla and send a or the . We've already been told Ford's electric SUV will be revealed later in 2019 before going on sale in 2020 but this tweet could mean a reveal is imminent. It's hard to draw conclusions based on this simple tweet but we can do some speculating. 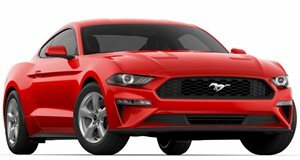 The timing during the Model Y's launch has us thinking Ford wants to compete with an SUV of its own but the inclusion of the Mustang logo could also point to a Mustang hybrid. We already know Ford's Mustang-inspired, much like how the new Chevy Blazer looks like a Camaro without actually being based on the same underpinnings. As for the Mustang hybrid, we have seen mated to a V8 engine. The earliest we could see either of these cars is next month at the 2019 New York Auto Show. We've reached out to Ford for comment but we couldn't get a confirmation of when the electric SUV or hybrid Mustang will make their debuts. For now, it seems like we should get excited because something big is about to happen with the Mustang and it involves electrification.